At Newtown Estates you can get the best of modern construction and give yourself peace of mind for years to come. Giving you will get a safer, more secure and worry free home. NEW TOWN is one of the finest Estates in Abuja, located opposite the Usuma Dam before Ushafa Bridge along Dutse-Bwari Road, Abuja. Real Estate investors and individuals will find this really worthwhile. 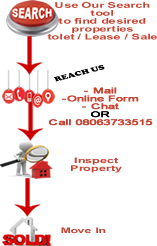 A good opportunity for potential home owners and developers in Abuja, FCT.